Yesterday, I went to see They Might Be Giants. As expected, it was a stupendous show. Whimsical middle-aged post-punks are not the subject of this piece, however. I was zoned out when the opening act took the stage, but was immediately, perhaps rudely, brought back to reality by what could only be described as an earthquake of bass. They were called Moon Hooch, and they were nothing like the accordion-strapping dork-rockers I expected them to be. Through the haze of the rainbow-light soaked mist of the fog machine they came - two saxophone players. One was playing relatively simple, repetitive melodies. The other seemed to have defiled his instrument with a long, hollow log that was belting a wubbawubba sound that sent my mind reeling back to my viewing of Spring Breakers a week or so ago. Behind it all, the 4/4 pound of the bass drum, with hi hat accents on the off-beat. It was... House music? Actually, I found, the band themselves call it “Cave Music.” Because it’s more organic, or something. The three, Mike Wilbur and Wenzel McGowen on Saxophones and James Muschler on drums, all graduated from Manhattan’s New School for Jazz and Contemporary Music and honed their craft in the city’s subway system. 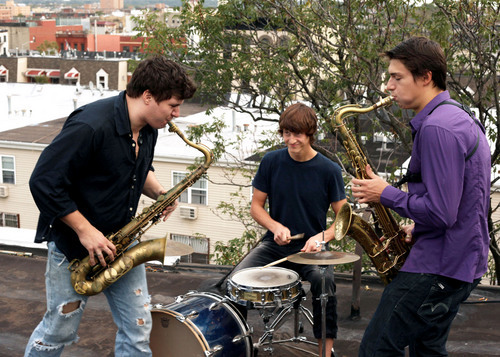 According to band mythology, the two sax players were initially bitter rivals who managed to set their differences aside for the good of Cave music. Their mission seems simple: to prove that anything you can do with a synthesizer, they can do with brass. Their live repertoire was surprisingly varied, mimicking with pretty consistent success a wide swath of popular dance-music’s vocabulary. While it doesn’t capture the absolute bombast of their live show, their recorded material is a lot of fun, and it allows the guys to show off their developed chops in a more evenly mixed, not so bass-heavy environment. Check the tour dates - Moon Hooch are well worth a few bucks and a couple of hours.